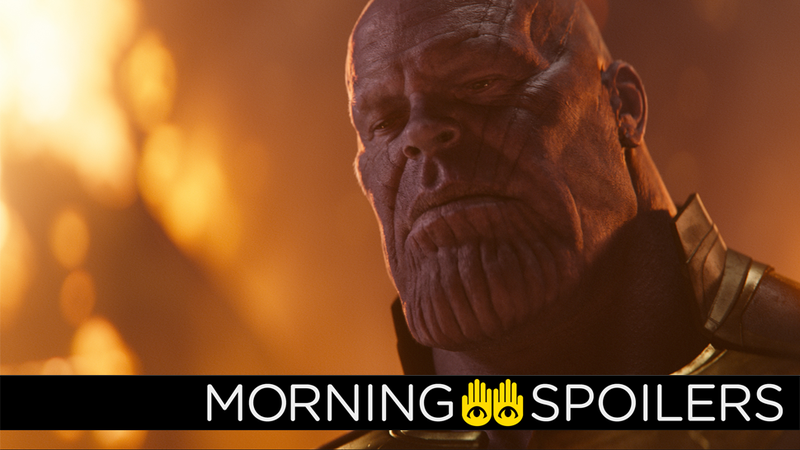 Which Other Jim Starlin Comic Creation Could Appear in Avengers 4? Dread it, run from it, other characters by your comics creator still arrive. Kiersey Clemons re-confirms her Flash role. A future Deadpool film could finally turn Morena Baccarin’s character into her comic book counterpart. Gotham will be adapting another comic book storyline for its final season. Plus, a sneak peek at the season finale of iZombie, and footage from the set of The Punisher. Spoilers now! Kiersey Clemons re-confirmed she’s playing Iris West on a recent episode of Conan. Imagine if I said no. Imagine if I was like, ‘I’m cut out of the whole thing.’ We talked about it though before so that’s not going to happen. I know I’m going to be in The Flash ... Yeah, I’m Iris West. Now we can bring her back as Copycat, and Morena [Baccarin] was very thrilled when she got the call. ‘We got the time machine working, and you’re still alive!’ ‘I knew it!’ It was really funny. During a Q&A at Wizard World Philadelphia, Ray Fisher stated he’s open to star in a Teen Titans movie. I mean, for me, all these movies, the only thing that I’m looking for as far as they’re concerned is stories that are grounded and stories that move me, you know what I mean? And that’s what kind of drew me to the DC Universe as opposed to some other things that were going on. It’s like, stories with consequence actually really appeal to me, where characters are going through recognizable struggle that I see in every day life. So if that translates to Titans or a Cyborg standalone or Justice League 2, as long as that’s there, I’m sold, man. I’m good with anything. A source at Splash Report claims to have a synopsis for the sequel to Zombieland, which will see Woody Harrelson‘s Tallahassee, Jesse Eisenberg‘s Columbus, Emma Stone‘s Wichita, and Abigail Breslin‘s Little Rock banding together again to ward off a new, heartier strain of “super zombies” alongside incoming characters Reno, TB, Cleveland and Madison. Reno is the Eve to Tallahassee’s Adam. She is everything he could ever dream of badass, skilled, strong. They’re a match made in heaven… if only she would take him. TB is Tallahassee’s spitting image. Essentially the same person. Similarly with Columbus and Cleveland. Madison is a ditzy blonde who Columbus hooks up with after Wichita freaks out from the lack of zombies and leaves (yeah, that happens really early on, it’s not a spoiler). The dynamic these new characters bring to the group make for some of the most entertaining scenes in the entire franchise. However, since they are mainly just extensions of the main four, they are pretty thin as individual personas. The official title and logo have been revealed on the film’s Twitter page. Bloody-Disgusting has another new image of the shark from Empire Magazine. Screen Rant has nine new character posters. Head over there to see the rest. Similar to the villain of the Ghostbusters remake, an inventor creates a device that amplifies paranormal activity in the trailer for Our House from IFC Midnight. Executive producer John Stephens revealed to Comic Book season five will also partially adapt Scott Snyder’s Zero Year story arc. There are, and I’m trying to remember which [stories] they actually are. There’s gonna be a little bit of Zero Year in there, you know as well. [You know] some of that stuff, especially with Nygma. And there’s another one but if I tell you what it is it really does spoil the story. Speaking with Variety at Netflix’s FYSee event at Raleigh Studios, Noah Schnapp stated season three balances the tones of the show’s first two seasons. Season 1, I feel like, was more playful. Season 2 was a lot darker. And then Season 3 does really well blending them together, and that’s what I love about it. Meanwhile, Millie Bobby Brown revealed Eleven will finally start to lead a normal life. It’s a beautiful storyline for Eleven this season. It’s really a coming of age for her and understanding what being a normal teenage girl is. The Rocinante seeks a new game plan as they attempt to avoid capture; Melba’s true motives are revealed; Naomi is torn between identity and ideal; Anna seeks a way to stay aboard the Thomas Prince. Rob Tapert and Lucy Lawless discussed the bleak future of the Evil Dead franchise during a recent panel at Motor City Comic Con. We knew going into the third season that there was a chance [we’d get cancelled]… the ratings had been turning down and it’s hard to change that. Starz had been a good partner. Pretty much letting us do anything we wanted. It was probably just not the right outlet for it… but they waited until the ratings came in for the third season. We sold the rights to the first two seasons to Netflix, but they won’t let a competitor have something [that’s theirs]… which I kind of understand. It’s unfortunate. We had a really great idea for where it was going to go in the future, and it was something Sam [Raimi] had been talking about: rebooting a movie. What that scenario could be. And then, Bruce wrote to Sam and I one day… ‘If they don’t [renew us], I’m retiring from Ash.’ [So we said], ‘But wait Bruce, what about a movie? !’ [He said], ‘No, I’m retiring.’ So. We’ll see. Sam and myself have been talking about what a new incarnation would be. Billy Russo returns in a new set video.